As GymnasticBodies has grown in popularity, more and more people have questioned what it was like to be one of Coach Sommer’s original athletes. The truth is, anyone who has attended a GB seminar can tell you first-hand what training under Coach is like. In fact, many current GB students have stated that their own journey has been an intense, but rewarding process. As one of Coach’s original athletes, I couldn’t have said it better myself. Training as a Junior Olympic athlete under Coach Sommer was a mixture of intense mental preparation, rigorous physical conditioning and constant competition for seniority among teammates. As we walked into the gym each day, one thing was certain—we needed to be on our toes. From routine days to handstand obstacle courses, there was no knowing what each day might bring; especially with the constant threat of a full-blown martial arts battle breaking out during practice. So, if you’ve ever wondered what it was like to train under Coach Sommer as a competitive gymnast, here’s your chance to hear the stories that rarely get told about what life was like as one of Coach’s athletes. From a young age my teammates and I were taught that when we were in the gym, we needed to be IN the gym with our minds focused on our assignments. Practice was a time to be serious and to get our work done. Whether it was basics day, new skill day, or routine day, the mentality that we had during practice was the same—If it wasn’t right, we didn’t move on. Just as the GymnasticBodies courses are structured, we would often start each event with simple progressions and move onto more difficult tricks as we demonstrated to Coach that we had the basics under control. It didn’t matter if we were on still rings, pommel horse, or trampoline; if a progression wasn’t right, we stayed on it until we were able to do it correctly. Each day, we started over from the first progression and worked our way up just as we had the day before. At first, completing each progression took multiple tries, sometimes even multiple practices, to get it right, but eventually, we were able to blow through the entire list with ease. It got to the point where we were able to demonstrate proficiency on each progression in a single try. Now, you might be thinking that this training style is a lot of pressure to put on a group of kids: but the truth is, we thrived under the intensity! This constant repetition had us competing against ourselves and against our teammates to see if we could progress further than we had the day before. We all wanted to be crowned ‘king’ of each event. The king was always the guy who worked the hardest, improved the most, and gained the most ground through the assigned progressions each day. Practices were like a giant round of gymnastics king-of-the-hill that never stopped! Anyone that knows Coach Sommer knows that showing proper manners and respect is one of his number one priorities. Proper manners were fundamental to our success in the gym. It’s no surprise that the words “Yes, sir” and “No, sir” were among the most common phrases used during our practices. While it was important to Coach that we showed him the respect he deserved, he also expected us to show that same respect towards others that we associated with. There was no room for rude behavior or bad manners towards others if you were a member of Coach’s team. As a young teenager, I got caught by this rule a couple of times. I remember one day, in particular, that I made a disrespectful comment towards one of the other coaches in the gym. I don’t really remember what I said, but I certainly remember how Coach reacted. Immediately after making my smart-alec remark, I found myself doing one of the most dreaded punishments that Coach Sommer had to offer; a punishment so dreadful that only ONE of my teammates ever had to do it more than twice in his entire career—wall parade. Wall parade was a series of v-ups, rope climbs, and handstands against the wall that lasted until you couldn’t feel your arms or abs. To put things delicately, it was NOT fun! Needless to say, it didn’t take me long to learn my lesson and to figure out that back-talk wasn’t an option. But life in the gym wasn’t all about the punishments, it was also about the rewards. Just as disrespect wasn’t tolerated in the least degree, being respectful and showing good manners was never overlooked; it was always encouraged and rewarded. Everything from holding the door open for someone, to helping a teammate move a piece of equipment, to getting a sharp, new haircut was rewarded by extra time in the foam-pit or a small game during practice. 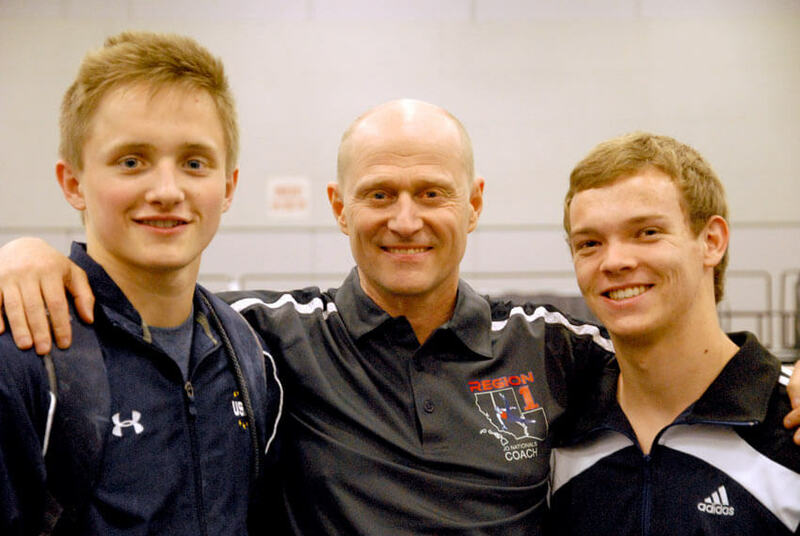 Coach maintained a constant balance between training us as gymnasts and training us as young men. Our performance in the gym was important to Coach Sommer, but how our training influenced our lives outside of the gym took precedence. Education was always a priority to Coach as he understood that maintaining good grades would affect our quality of life long-term. Bad grades didn’t fly. At the end of my first semester of school as one of Coach’s athletes, I noticed that all of my teammates had their report-card in their hand as they walked into the gym one day. As a new member of the team, I wasn’t quite sure what was going on, but I quickly learned that Coach expected us to show him our grades each quarter. If we wanted to work out, we needed stay on top of our school work. Now, that didn’t mean that if our grades were bad we weren’t allowed to go to practice. In fact, we were still required to be at practice on time each day. This time, instead of having our gym-bag, we were required to have our backpack and our books. Instead of warming up with the team, we sat next to Coach and did our homework. When we finished our work, Coach would look over it to make sure it was right. If it was wrong, we went back and fixed our mistakes, just like we did when we were on the equipment. After our homework was done and every problem was correct, we were allowed to jump into practice with the rest of the team. Like any successful coach, Coach Sommer was always just as concerned about our well-being outside of the gym as our results on the equipment. Like I mentioned earlier, life in the gym with Coach Sommer was a constant balance between hard work and cutting loose to show off the skills we had learned. While there were days filled with routines, there were also days filled with different competitions and physical challenges. Similar to the current GymnasticBodies approach, once the basics were locked-in, it was time to play! One of the most common challenges on Coach’s team was the handstand obstacle course. Using equipment found in the gym, we would create a giant obstacle course that included stairs, ramps, curves, and drop-offs. The Goal was to be able to make it through the entire course while only walking on our hands. If you fell, or if anything but your hands touched the ground, you lost. We also played games on the trampoline like add-on, where we had to do a series of tricks without making a mistake, or STICK, where we had to do a flip or twist off of the tramp and land without moving our feet. We would have pit-fights or dodgeball tournaments with foam blocks, and yes, we would even have the occasional martial arts battle—but be warned, Coach knows a thing or two about martial arts! So, what does any of this have to do with GymnasticBodies? Well, it explains how GB approaches training now. 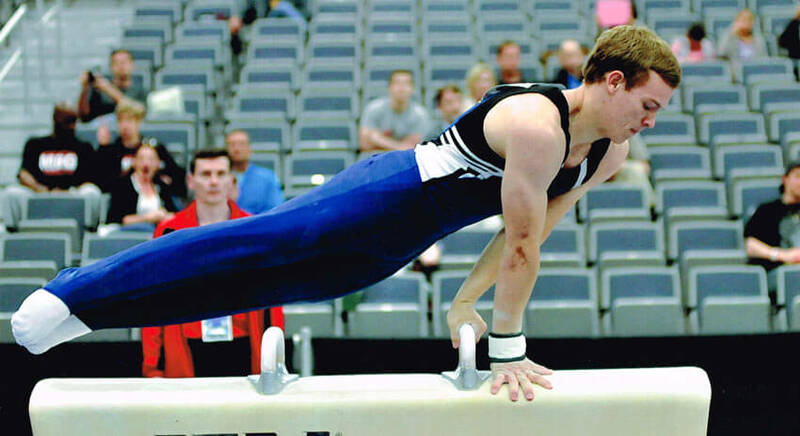 The GB courses teach you step-by-step how to do some of the most envied gymnastic exercises just like when my teammates and I were training as Junior Olympic gymnasts. Each workout has been created using the same methodical approach that Coach Sommer put into our training as kids. How your training affects your day-to-day life outside of the gym is most important. Our goal is to help you become the best version of yourself that you can be by helping you to improve your physical health and quality of life. One you’ve mastered the basics, you’ll be ready for the most exciting part of GST—showing off your skills. So, go ahead and give it a shot! Find out for yourself what training under Coach Sommer is really like by joining the GB community. Reap the benefits of a strong, mobile, sustainable body attained by at-home progressions that allow you to be an adult AND an athlete!